Swan Hill was named when the explorer, Major Thomas Mitchell, set up camp by the Murray, and had his sleep continually interrupted by the calls of the black swans on the river. His glowing reports of the area led to the establishment of the Murray Downs and Tyntynder properties in the mid 1800’s. Swan Hill really found prominence in 1853 when a race between two paddle steamers from the mouth of the Murray at Goolwa (SA), saw them both arrive within 20 minutes of each other. The challenge, taken up by the skippers of the PS Lady Augusta, the winner, and the Mary Anne, was aimed at proving the viability of the great river as a viable means of trade and signalled a romantic and historical era of riverboat trading along the length of the Murray and Darling river system. The Pioneer Settlement is a recreated port town of the river trade era, complete with its own paddle steamer, the PS Pyap. Just a five minute walk from the motel, the Settlement features a historic main street comprising over fifty original local buildings. Horse drawn wagons and old vehicles cruise the street offering free rides. There is also a collection of restored carriages, old cars, trucks, tractors, stationery engines, and a steam train. 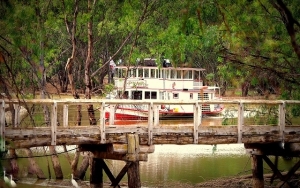 The PS Pyap cruises the bends of the Marraboor (Little Murray) and Murray rivers twice a day, departing from the Settlement wharf. In 2017, with the help of a government grant, a brand new Laser light show was installed at the Pioneer Settlement. The Heartbeat of the Murray spectacular shows nightly, on a wall of water. It tells the story of the Murray River from its origins in the dreamtime, to the present day. It is really a state-of-the-art spectacle, and should not be missed while you are here. The gallery is located adjacent to the Pioneer Settlement. It contains a wonderful changing display of visual art, often featuring gifted local artists, particularly from the indigenous community. Special exhibitions are held all year round. Check at the gallery. The small township of Lake Boga, just 12 kilometres south of Swan Hill , once was home to over 1,500 people, working to support Australia’s efforts in WWII. To find out more, a visit to the fascinating Catalina Flying Boat Museum, right on the grassy shores of the lake which gives its name to the village, is a “must-do” whilst in the region. The wonderful and educational Museum has been established and managed by volunteers and today houses numerous displays & a collection of memorabilia, including a Catalina Flying Boat. A video presentation in the theatrette will set the scene for your visit. And don’t forget to walk through the underground bunker that housed the communications centre. Pheasants, Guinea Fowl and Partridges are commercially reared and prepared here to find their way to the tables of high class restaurants throughout Australia. There is also a beautiful garden with aviaries housing a wide range of native and foreign birds. Guided tours though a local property are available with a diverse range of produce on show. See the workings of the almonds, olive and pistachio farm, from the orchard through to the production of the own products. Then visit the cafe for a light lunch or afternoon tea. 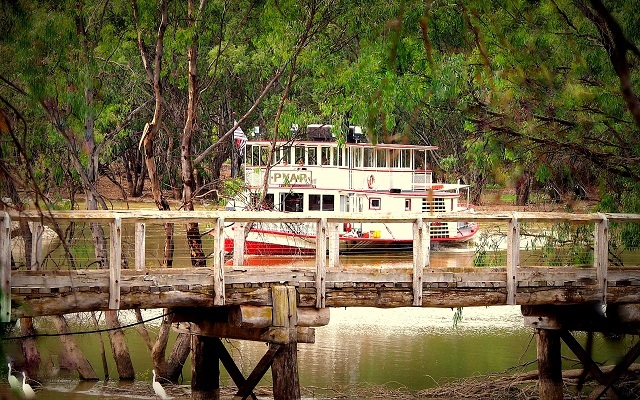 Visitors to Lake Boga are fortunate to be able to experience three local attractions all in the one spot. Bogartz Glass Studio showcases the contemporary slumped glass works of John Fowler, and maybe even see the artist at work. John’s works are in exhibitions around the globe and are available for purchase at the studio. When he’s not creating glass masterpieces, John conducts a daytime program at his Planetarium. Learn about our galaxy and beyond….. and then return to the Observatory after dark for a hands-on, enthralling visual trip around the clear night skies of the Victorian Mallee. APW, as it is known amongst the locals, produces a wide variety of wines using grapes grown predominantly in the local region. A cellar door is open daily, about a 45 minute drive west along the Murray Valley highway.